You’re going to be tempted to “figure out” Maniac. Deny the temptation. You’re going to want to fill in the blanks of its indeterminate near-future setting, an analog, gig-economy dystopia as designed by Paul Rand—Blade Runner with Electric Dreams-era tech draped in thick lines. Don’t. You’re going to want to decode the colliding trajectories of grieving addict Annie Landsberg (Emma Stone) and potentially schizophrenic black sheep Owen Milgram (Jonah Hill), who each have their reasons for enrolling in a pharmaceutical trial comprising three experimental drugs, some Eternal Sunshine Of The Spotless Mind hardware, and its creator’s lofty aims of eliminating “unnecessary and inefficient forms of human pain forever.” Pass on that. None of these words will prevent any of those things from happening. 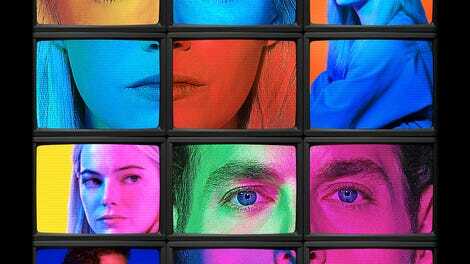 If the television track records of Maniac’s driving creative forces—True Detective director Cary Joji Fukunaga and Leftovers writer Patrick Somerville—are any indication, the 10-part Netflix series will be splayed out on the internet’s dissection table before the weekend is out. It’s only human nature to seek out answers; it’s only modern pop culture habit to view every new, challenging piece of art as a puzzle to be solved, like the Rubik’s Cubes that factor prominently in Owen’s waking life and in the fantasies induced by the researchers at Neberdine Pharmaceutical and Biotech. Puzzling over Maniac seems like the worst way to watch it. Like the best works of on-screen surrealism, the series—developed by Somerville and Fukunaga and based on a Norwegian format—knows that dreams are only what we make of them. And with few exceptions, Owen’s and Annie’s escalating series of genre-hopping, time-traveling, artificial-intelligence-monitored fantasies operate by their own inscrutable internal logic. They shift on a dime; characters blip in and out. It’s all supposed to have some greater, psychological purpose, but that’s explained in a sequence where the control-track grotesqueries and the Steve Brule’s-handsome-kid-brother on-camera discomfort of Dr. James K. Mantleray (Justin Theroux) are simply too distracting (and too funny) for any of the pertinent information to sink in. If nothing else, Maniac is a triumph of production design. It envelops itself in a bricolage world that’s at once familiar and fresh, a drab forecast reflecting elements of 1970s graphic design, Brutalist architecture, sky-high neon advertisements, and vintage PC branding. Its most advanced pieces of machinery—roaming sanitation robots, a mass-produced isolation booth called the A-Void—look like chunks of the original Battlestar Galactica fallen to Earth. Practically everyone in the show’s New York City who isn’t a Milgram is broke, so there’s a financial imperative to get locked up in the NPB offices for a few days, but the look and feel of the place is preferable to the outside world, too. In there, it’s all matching jumpsuits and geodesic grids. Beyond these Beyond The Black Rainbow chambers lies a disconnected civilization where a service called Friend Proxy thrives and a horrifyingly plausible version of targeted advertising can be used in lieu of legal tender. Submit to a battery of barely personalized sales pitches from a contractor in a rumpled overcoat and fedora and a person can go about your day without actually paying for any good or service. It’s an ingeniously realized world whose surface is pockmarked with rabbit holes, each itching to be tumbled down. And the fact that you can get this far into a review of Maniac without delving any deeper into the characters is evidence of what a sly act of sleight of hand it is. It’s a function of the show’s ambitions. Annie is a woman who’s experienced a profound loss, who’s been self-medicating that wound with the first drug administered in the trial. But at a certain point in the trial, she’s both of those things and an elfin ranger guiding an ailing princess to a mythical place of healing. The genre and style of Maniac is continually rebooted, and Maniac has to leave room for those genres and styles to imprint themselves on the characters. The advantage is a thrilling, short-story sense of episodic narrative that leaves a surprise around every closing credits sequence. The disadvantage is that everything seems to blur out when the protagonists dig in to the people they were before they were numbers and jumpsuits inside NPB. Fortunately, Maniac has talent on its side. Fukunaga’s fluid directorial style sends the series gliding through scenery that’s saturated with color and texture. (Keep your eyes peeled for a critical piece of True Detective ephemera.) The writers’ room is populated by veterans of Peak TV’s headiest projects—not only The Leftovers, but Mr. Robot, too. And the casting is spot-on, from Netflix repertory players like Billy Magnussen (adding to his growing résumé of handsome buffoons as Owen’s criminal brother) and Julia Garner (escaping the Ozark morass to play Annie’s sister/primary source of guilt) to Sonoya Mizuno, flipping her beguiling Ex Machina performance to play the steely scientist in charge of a rogue AI. The marquee names all do superlative work playing against type: Hill in his muted embodiment of Owen; Sally Field opening a largely untapped vein of villainy (give or take a Legally Blonde 2) as Dr. Greta Mantleray, a self-help guru who’s the other Dr. Mantleray’s mother and pseudoscientific foil. Justin Theroux goes a bit big with his big-dreaming brain doctor, but it’s a potent reminder that he should be allowed to go sillier more often. The same can be said of Stone, who swallows Mantleray’s Alpha-Bits-shaped pills and is immediately consumed by the theater-geek-in-the-wig-closet fire of her Saturday Night Live hosting gigs. She throws herself into the zany accents and colorful characters spit out by Annie’s subconsciousness, scoring laughs whether she’s committing to the fantasies or picking them apart. But she’s also a crucial grounding force amid the madness: No matter the inconsequential contents of Maniac’s epiphanies and soliloquies, Stone’s matter-of-fact manner commands attention. At one point, Annie tells another character in mourning, “You’re always going to feel that way,” and the flimsy platitude takes on heft and accuracy in Stone’s telling. Annie’s not a whole lot of character, but she is a tremendous Emma Stone performance. 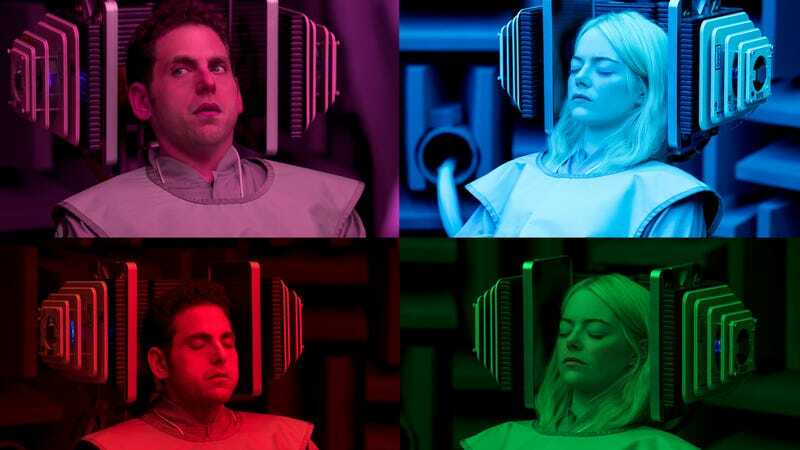 Maniac is one of the year’s most refreshing series and a series that always seems 10 seconds away from declaring, “The most complicated computer of all is the human mind.” It’s hypnotizing eye candy that won’t completely nourish the brain or the soul, but it will satiate them for a little bit. While playing fast and loose with two of contemporary TV’s prevailing subjects—mental health and addiction—Maniac comes to some tidy conclusions that might provoke flashbacks to the touchy-feely conclusion of True Detective’s first season. But touchy-feely is hard-wired into Maniac’s circuitry: its reflections of yesterday’s intersections between New Age philosophy and science fiction; its rejection of the Apple Store’s sterile world of tomorrow, today. 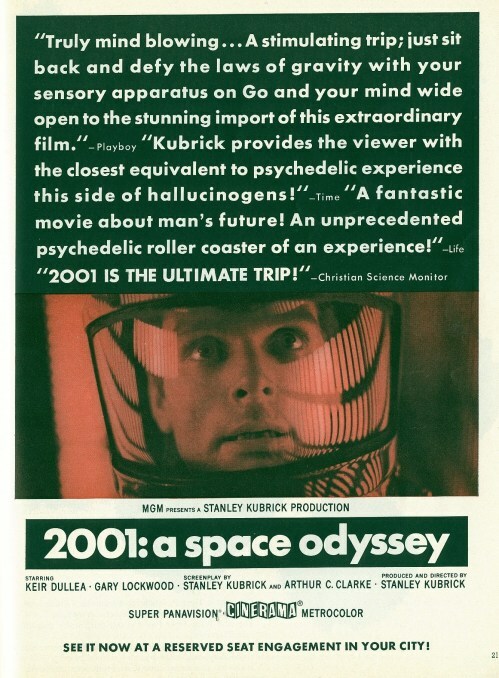 The evolutionary hand of 2001: A Space Odyssey can be glimpsed throughout Maniac’s run, but this version of the ultimate trip envisions its ghost in the machine not as dozens of slick, transparent cartridges behind an electric eye, but a sprawling mass of circuitry and wires expressing itself through a dot-matrix face. Like Maniac, she’s a beautiful mess longing to be understood—but nothing good comes to anyone who tries.